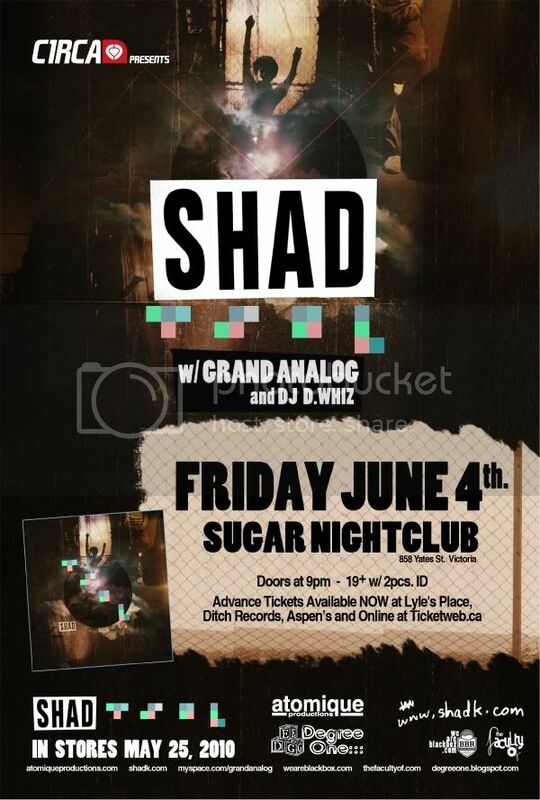 Degree One Events: It's SHAD w/ Grand Analog at Sugar in Victoria...!! It's SHAD w/ Grand Analog at Sugar in Victoria...!! w/ guests Grand Analog and DJ D.Whiz. Shadrach Kabango is quickly becoming one of Canada's most respected young artists. His sophomore record, The Old Prince, was received with top reviews by music publications across the board, and snagged a Juno nomination for 2008 Best Rap Recording of the Year, as well as a spot on the 2008 Polaris Music Prize short-list. After completing 3 national tours in 2008, Shad will pack his bags and tour almost 50 cities in the US on the 2009 VANS Warped Tour. Shad's growth as a musician really shines through on The Old Prince, which completely smashed the music community's already-high expectations. Receiving 5N's in Now Magazine, 10/10 on RapReviews.com, and equal comparisons to Kanye West and Common on OkayPlayer.com, Shad became one of the most talked about Canadian hip hop artists in 2008. Combined with constantly touring his incredible live performance, and three outstanding music videos (The Old Prince Still Lives at Home became YouTube's #1 featured video World Wide), The Old Prince allowed Shad to reach out and attract fans right across the globe. Shad broke ground with his 2005 independent debut When This is Over, which earned endless respect for its honest and clever lyrics and its distinct musical aesthetic. Shad toured the album, selling out solo shows, playing for campuses across the country, and landing opening spots for the likes of Common, Lupe Fiasco, Classified and K-OS. His constantly developing fan base and reputation as one of just a few rappers with an excellent live show, landed Shad invaluable stage-time at a variety of festivals including Hillside, the PTBO Folk Festival, Wakestock and Manifesto. With two instant classics under his belt, Shad continues to walk the humble path he always has. He appreciates the chance to make and share his music, and he feels really lucky to have his art received the way it is.